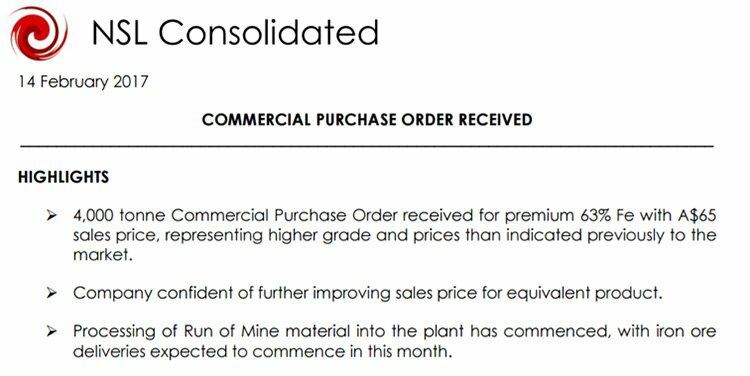 It’s been some time since we last checked in on NSL Consolidated (ASX: NSL), a commercially savvy minerals miner, that’s travelling at speed towards production status later this year. We’ve seen a spectrum of commodities stage resurgent rallies in recent months, backed by factors ranging from the trivial to the Trump. ...and could reinforce this initial salvo with an additional 200,000 tonnes, as part of an expansion phase being actively deployed. Part of that expansion has been the 250 acres of land for pellet plant and 750 acres of land for an integrated steel plant allotted to NSL by the Andhra Pradesh government through its joint venture with the company. Based on current Indian mining and pellet industry norms for integrated plants, this indicates a possible AU$44-$52 per pellet tonne operating profit for a NSL owned pellet plant. This figure is speculative at this stage and anyone considering NSL for their portfolio should seek professional financial advice before making an investment decision. As well as representing the achievement of another material milestone for NSL in developing the project, it also highlights the importance of continued support from the government of Andhra Pradesh – which will talk more about shortly. NSL has also been buoyed by process optimisation results at its Phase Two Wet Beneficiation Plant. Utilising very low grade waste iron ore feed to test the process boundary limits NSL has been able to exceed expectations, with full plant process beneficiating low grade iron ore waste from as low as 14% Fe feed regularly to in excess of 62% Fe and up to 65.3% Fe. The results of this testing mean there is potential upside to the expected plant production grades and as a result, sales prices. These results could offer up further commercial opportunities for NSL both in profitability and breadth of customer base. 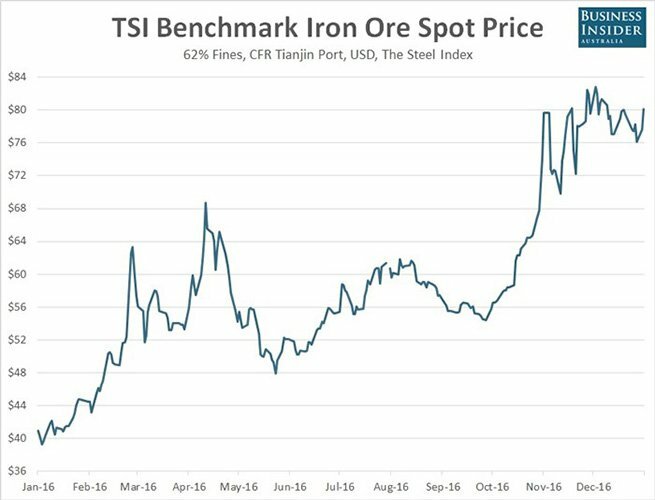 All in all, when the iron ore price looks like this – it’s going to make companies like NSL get onto an increasingly large share of investors’ radars. The share price of our chosen small-but-determined ASX steed has really taken significant steps up the valuation ladder over the past year. Since we last covered NSL in the March 2016 article Cashed Up NSL Now on the Inside Track for Positive Cashflow , we have sat back and watched as its share price has gone up by as much as 525%. Compared to giants such as Fortescue Metals that is significant. But there may be still more upside to come in NSL – just as its expansion plans are starting to kick into gear. Here at The Next Mining Boom, we think it could be a sign NSL is outpacing rival ASX small caps in getting to production just as the iron ore recovery takes flight. 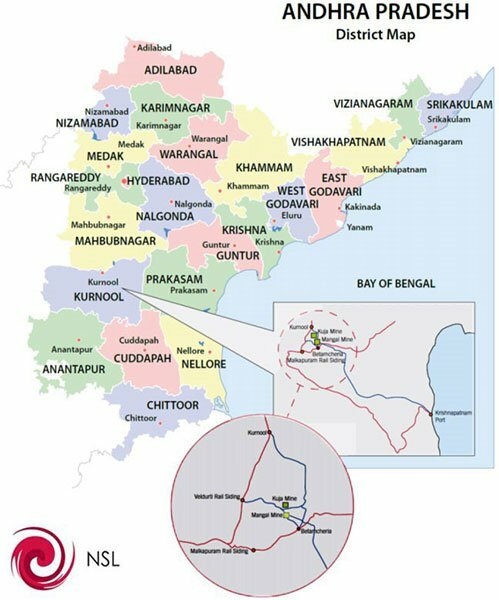 NSL Consolidated (ASX: NSL) has been toiling away in Andhra Pradesh — for over 7 years and over that time the State has become the number two State in India for ease of doing business. In fact Andhra Pradesh has a 15 year business plan that would see an expected 14% growth rate projected to 2029, based on an aggressive infrastructure program including airports, ports, highways and a new Greenfield Capital City. Andhra Pradesh has a single window process for investments and projects, with a guaranteed 21-day approval timeframe for all state permissions. Which is one of the reasons NSL has been working so closely with the state and built up such a formidable relationship. 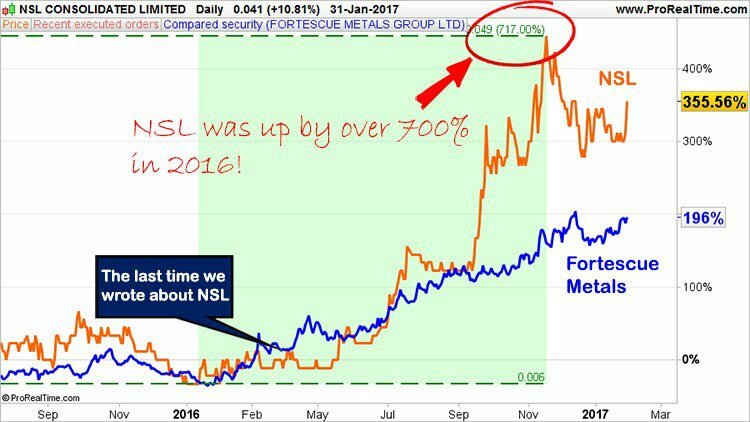 2016 saw NSL transform from a tiny $8.5M capped minnow, to a $90M capped emergent iron ore producer. We’ve kept tabs on NSL’s progress right for some time, publishing a series of articles since 2015 .In this article, we’ll go through a refresher for those of you just coming to the story. NSL is the only foreign owned iron ore miner in India, in what is an extremely large domestic market. The big news is a deal which could see NSL partner with a billion dollar company to build a steel mill (more on that later). The most recent news has been just as enthralling, including optimisation results indicating potential upside to metallurgical test work and results conducted for its stage two wet beneficiation plant. Further to previous wet plant commissioning updates released by NSL. Utilising very low grade waste iron ore feed to test the process boundary limits, NSL has been able to exceed expectations , with full plant process beneficiating low grade iron ore waste from as low as 14% Fe feed regularly to in excess of 62% Fe and up to 65.3% Fe. The results of this testing mean there is potential upside to the expected plant production grades and as a result, sales prices leading to further commercial opportunities and a potential extension of its customer base. NSL has ramped up operability of the crushing and screening plant and will commence to feed ROM material grading between 25-35% Fe into the plant in the coming week. Further to this, NSL expects sales of the wet beneficiation plant product produced to commence in February, with multiple customer discussions at the final stages. Given the positive optimisation results and imminent sales, NSL has commenced the process of employing shift supervisors, plant operators, mobilising stockyard fleet with goal of ramping up of throughput and production to a 24-hour operation to meet expected production and financial targets in the coming months. 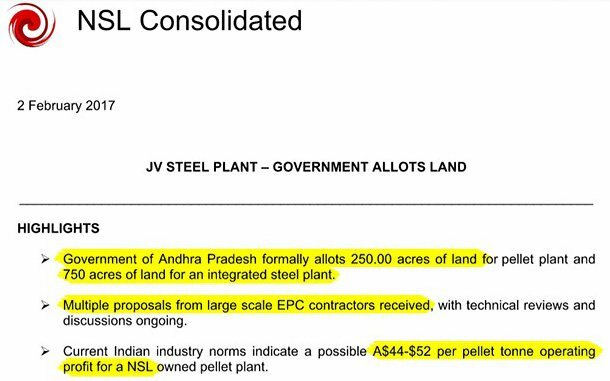 This news plays nicely into NSL’s hands following the announcement that Andhra Pradesh has formally allotted 250 acres of land for a pellet plant and 750 acres of land for an integrated steel plant in Orvakal Industrial hub, Kurnool District. Given NSL’s ambitions to expand operations, this presents a further milestone for the company and could be quite profitable based on current Indian mining and pellet industry norms for integrated plants. In fact, the deal indicates a possible AU$44-$52 per pellet tonne operating profit for a NSL owned pellet plant. NSL will now continue to progress the pellet plant pre-feasibility in line with its Indian iron ore beneficiation strategy. NSL is sticking to its word — and gradually bringing its iron ore production aspirations into reality. It’s all happening in a country that’s busting a gut to compete on the industrial world stage. Here is a map of NSL’s current operations in India — where NSL hopes to launch a four-phase production spree beginning as soon as this month. That’s right folks, after months of heavy lifting, NSL is now on the cusp of production. Initially the expected production capacity is 200,000 tonnes per annum, although this is expected to quickly double to up to 400,000 TPA on the back of project developments being hatched at NSL’s HQ. NSL has built the phase one plant, which has production capacity of 680,000 TPA throughout – with total output aimed at about 200,000 TPA. The company brings in ore at grades of 20-35%, with a resulting 50-55% grade iron ore after processing – which can then be sold off to steelmakers in the region. This plant is already producing, and offtake deals with major industrial customers are penned. And the revenue is starting to come in. 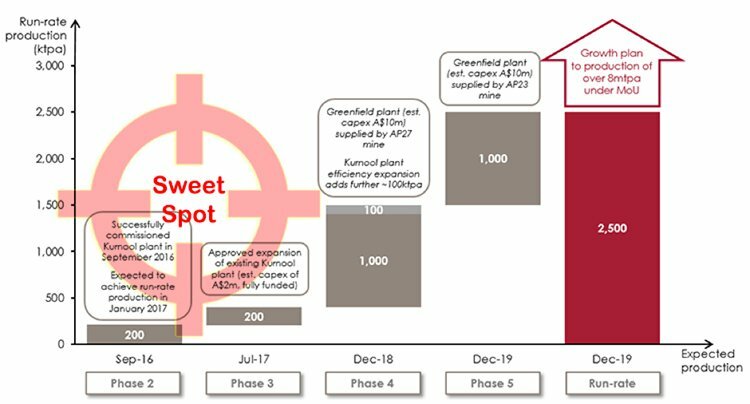 NSL is entering its ‘sweet-spot’ with a clearly defined production pathway ahead that will see it expand production over the coming years to reach 2,500,000 TPA by 2019. Given the information available so far, NSL is on track to generate ROM feed grade ranges of 25-35% Fe and produce high grade premium price product, of 58-62% Fe. 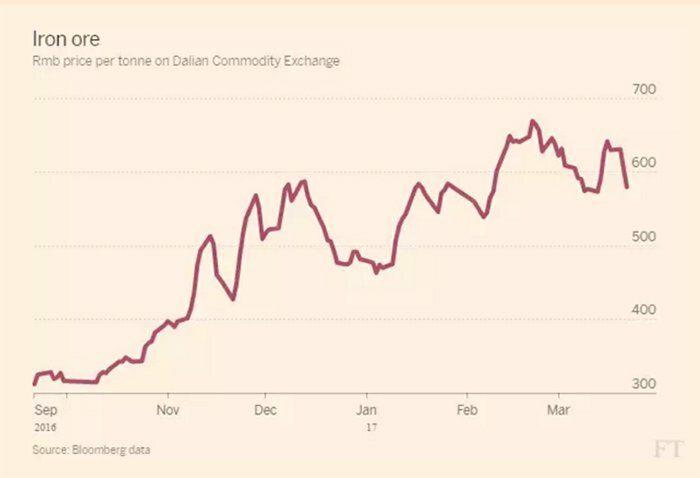 The iron ore price fell to a decade low of $US38 a tonne in late 2015, then rebounded by 80% in 2016. Renewed iron ore demand from China helped lift prices to around US$65 per tonne, breaking out of the $US40-60 a tonne range set over the past few years. Current Indian industry norms indicate a possible AU$44-$52 per pellet tonne operating profit for a NSL-owned pellet plant. Some market watchers are calling it a “swing for the sixties” — and just like in the 1960s, it would seem the going is good. Of course, as you can see above, commodity prices do fluctuate and caution should be applied to any investment decision here and not be based on spot prices alone. Seek professional financial advice before choosing to invest. According to NSL’s feasibility studies, the Phase 2 plant will produce iron ore at a cash cost of $22 per tonne. Meanwhile, iron ore prices are in the mid-US$60’s per tonne. It’s also already bagged offtake deals with two major Indian players in JSW Steel and BMM Ispat – meaning all NSL needs to do is get the plant on site and producing. NSL continues to make good progress towards taking its Phase Two wet beneficiation project into production. NSL recently successfully completed the assembly stage of the plant, and then significantly progressed the commissioning of the plant. A milestone was achieved with the energising of the grid power transmission line for the delivery of 33kV power to the site so that the site is now fully functioning on mains power. With the electrical commissioning of the plant complete, it is fully operational and ready to commence production now. With the economic advantages NSL’s plans bring to one of India’s poorest regions, Andhra Pradesh, the local communities can’t wait to start mining. These local communities, with whom NSL will be working closely for at least the life of NSL’s first mine, or around 10 years, are fully on-board with iron ore development. 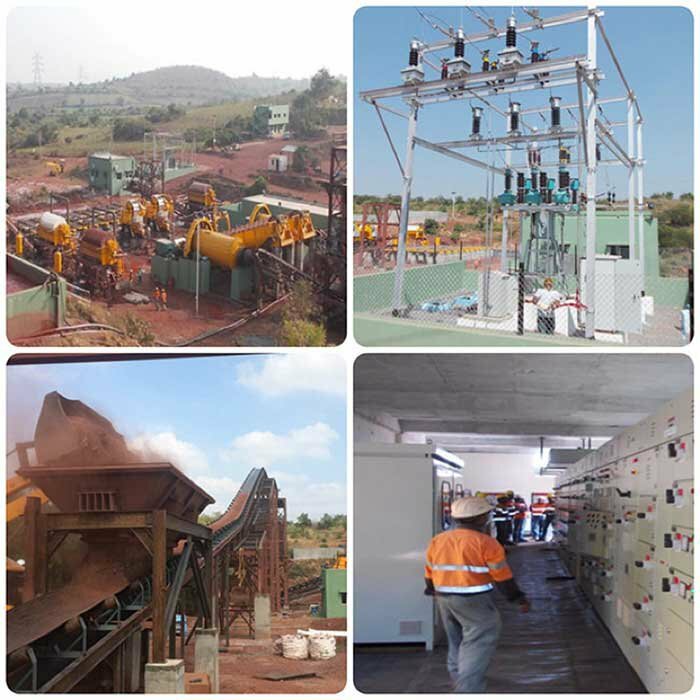 Take a look at the snaps from NSL’s debut “energisation” which got its iron ore production plans firmly underway. As you can see, NSL was welcomed with open arms. The nature of NSL’s operations makes them open-ended and with plenty of room for growth and expansion. NSL has secured access to the second largest mining lease in the region with a 77-acre tenement package holding significant quantities of iron ore amenable to NSL’s beneficiation process. The entire operation is also located less than 10kms from the wet beneficiation plant and stockyard. As a ballpark figure, if both of NSL’s plants are up and running at maximum capacity then NSL can expect to generate free cash flow around $10.9M per year. 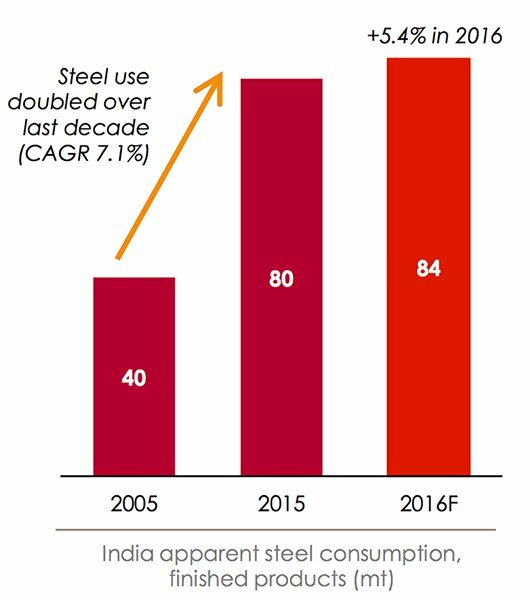 We should note that’s a ballpark figure only and it relies on full production and offtake from both plants and makes assumption that domestic steel prices remaining exactly the same – which is fairly unlikely. But the great thing about the offtake deals is that they remain non-binding, meaning NSL is free to explore the market for a better deal. NSL is working hand-in-hand with Indian authorities and snaffling up premium operational space as well as strong connections in a country still in the early stages of reaching its massive industrialisation potential. All things considered, we think now could be time to look to both India’s and China’s long-term growth prospects and to seriously consider building some exposure to the rampant growth occurring in these fast growing nations. According to the largest accounting company in the world, PwC, India and China will win the lion’s share of global growth between now and 2050. This means plenty of investment opportunities relating to raw materials, manufactured goods, food, medicine and pretty much everything else that comes with larger incomes and mushrooming spending habits. Iron ore prices have begun their recovery after years of yo-yoing to the beat of Asian industrialisation. Prices have been on the rise in 2016 and are now at levels not seen for several years. Concurrently, NSL is building India’s first commercial iron ore mining operation to supply its ambitious modernisation drive spurred on by India’s progressive leader, Narendra Modi. NSL is an eager-beaver digging its way to an iron ore war chest in lockstep with an uptrend in iron ore prices. That’s the kind of investment opportunity we look for at The Next Mining Boom — small-cap rising stars that have the wherewithal to navigate their way through the choppy waters of mining project development to emerge successfully. However, like all small mining companies, there are still hurdles to jump so caution is always recommended if considering an investment in NSL. 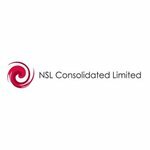 NSL has been toiling away in India for over 7 years. It has seen ups and downs, twists and turns, lefts and rights, but importantly, NSL now has clear road ahead to advance its Indian iron ore game plan all the way to the finish. Imminent Indian production is already being earmarked for expansion to the heady tune of 2,500,000 TPA by 2019. Meanwhile, a Chinese MoU deal is waiting in the wings, subject to a pre-feasibility report that is expected in coming months. NSL is now on the verge of opening India’s first foreign-owned iron ore mine, recording its first iron ore revenues and establishing a clear production path with first-mover advantage attached. All this in a country with over a billion people and an industrial demand ramp-up rivalled only by China.